Women's extra large socks are necessary if you wear longer or wider shoes. They can be hard to find unless you know where to shop and understand the basics of socks, including how they are sized. Rib Knit Socks: These classic socks come six in a pack and are a must for any woman's collection. These socks are priced around $20. They come in sizes 1X and 2X and in your choice of colors such as white, black, or assorted. Assorted gives you the option of choosing from a mix of khaki, green, rose, royal blue, heather and gray or a mix of black, white, chocolate, green, berry And navy. All socks are done in a blend of cotton and nylon and have non-binding tops. Multi Textured Trouser Socks: These socks come in sizes XL and XXL and are sold in a package of six. They are priced around $20 and feature extra wide, soft comfort tops and are made from nylon. These socks come in your choice of solid colors, multi-textured or animal prints. Open Weave Socks: These extra-wide soft cotton socks, priced around $15, are available in colors such as heather gray, white, black and navy. They come in sizes 1X and 2X. A great feature of these socks are that you can wear them as crew socks or fold them down to make them ankle socks. Hanes No-Show Sport Socks: These socks come in a pack of six and are perfect for any activity. Priced at just $10, they come in your choice of white or black, These socks fit shoe sizes five to nine and are done in a soft cotton knit that wicks moisture from the skin. They stretch generously to fit your foot and have a cushioned sole and a no-show top that won't slide down. World's Softest Over-the-Calf Socks: These socks fit to right under your knee and will provide support for tired and aching legs much like a compression-style sock. Priced under $10 a pair, these socks come in your choice of black or white and are available in size medium (which is equivalent to shoe sizes 5.5 to 9.5). Some other features of this sock style are an ultra-soft toe seam and lightly cushioned footbed. 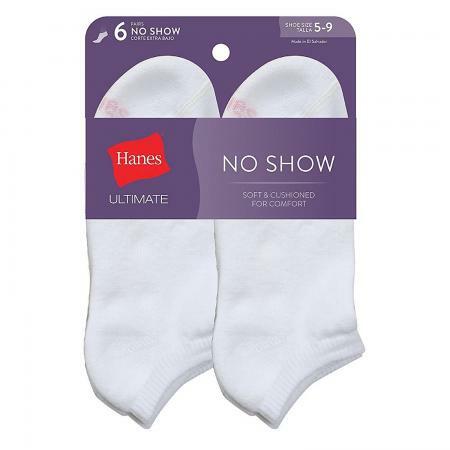 Hanes Women's Constant Comfort No-Show Socks: These socks come in a pack of three and are priced at about $10. You can choose from an assorted pack featuring black and purple or black and pink. These socks are unique in that they feature X-Temp® technology that makes the socks breathable and adaptable to a range of temperatures. Other features of this style include smooth toe seams, targeted cushioning, and spandex for stretch. 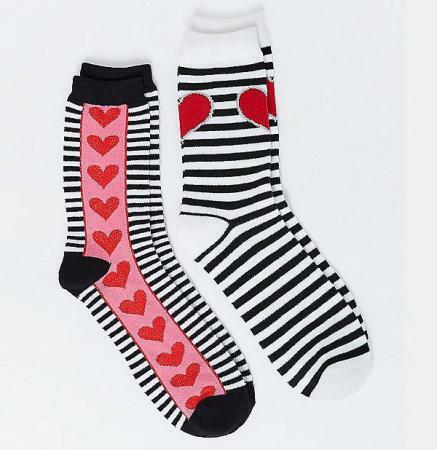 Stripes and Hearts Crew Socks: These cute socks come in a pack of two and are priced around $10. They feature a heart design on each sock and have reinforced toes and ribbed cuffs. These socks come in one size fits most. Chevron Sport Socks: These socks, priced around $10, come in a pack of three. They are done in a low-cut style with ribbed cuffs. They are done in black, blue, and red chevron against solid black. Trouser Socks: These socks come in a pack of two and are priced under $10. They come in black and charcoal gray and are available in one size fits most. These socks reach right below the knee and are a great classic sock style that can be worn with anything. Essential Trouser Socks: These knee high socks, priced around $6, have a textured sole and are made from a knit blend of nylon and spandex. They have wide cuffs and are sheer and comfortable to wear. These socks come in one size that fits sizes 10-13 and in colors such as navy, brown and black. Scallop Ribbed Ankle Socks: Choose between white or navy for these great socks. Priced at about $6, these socks have a form-fitting rib and scalloped cuffs. They come in one size that fits shoe sizes 10-13. 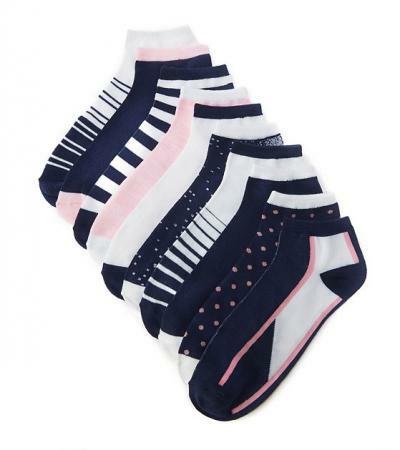 Pink Mix Socks: Sold in a pack of 10, these ankle socks are priced at around $16. They feature patterns of navy, pink, and white designs. Each pair has a ribbed band opening and is done in a soft blend of polyester and spandex. These socks come in one size that fits shoe sizes 8 to 12. World's Softest Classic Low Socks: These socks, priced under $9, come in white and black and in sizes medium and large. They are done with a fully cushioned sole for ultimate comfort and feature a low profile toe seam. These socks are made to wick moisture from your feet to keep your feet dry and comfortable all day. Simcan Comfort Mid Calf Socks: These socks come in sizes small, medium and large and in a variety of colors such as charcoal gray, navy blue, white and sand. They are priced around $10. These medium weight socks are designed to not sag and bind making them comfortable for all day wear. FootSmart Extra Roomy Socks: Designed for diabetics, these socks are extra roomy and comfortable. Priced around $10 a pair, these socks have a lower calf circumference of 11 inches to 23 inches. Other features of this style include a ribbed cuff and padded footbed. 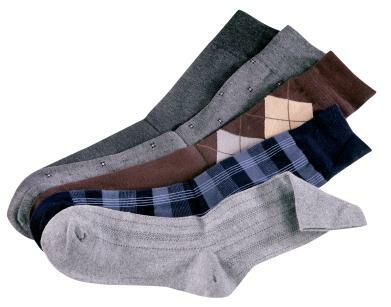 These socks come in a range of colors such as white, brown, black, navy and khaki. If the sock is too short: Strain is placed on your toes which could lead to hammer toes or ingrown toe nails. If the sock is not wide enough: You run the risk of feet becoming overheated which is uncomfortable and can lead to athlete's foot. If the top of the sock is too small: It will cut into your ankle and leg, which is uncomfortable and may cause circulation problems. Fits 9-11 are sized to fit a women's narrow or medium width foot that wears a size 6 to 11 shoe. Fits 10-13 are sized to fit a woman's medium or wide foot that wears a size 8 to 12 shoe. This is usually the best size for women's extra large socks. Check each brand or store for their size specifications. Some stores offer socks labeled super size, extra roomy or oversized. Sometimes you wear socks as fashion statement. Other times you wear them simply for comfort or to keep your feet warm. Regardless of the reason you wear them, it is important that they fit correctly. With the many styles of women's extra large socks available, you can choose from a wide selection of styles in light or heavyweight fabrics that provide both fashion and comfort.